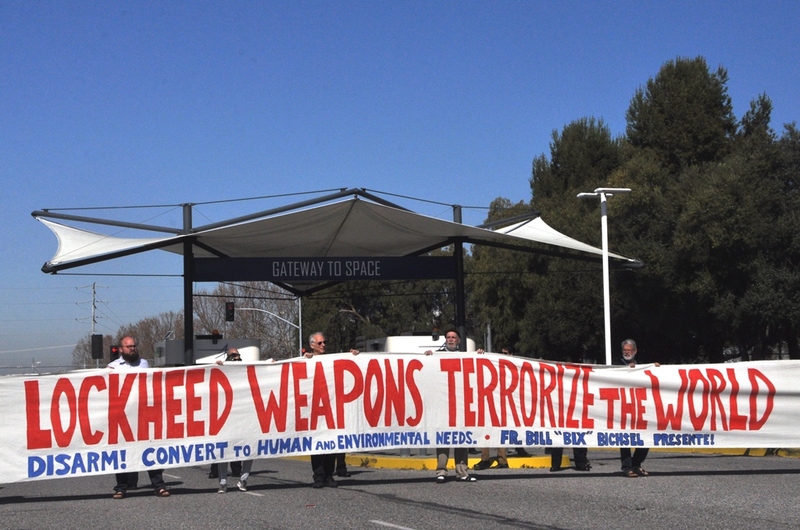 For the third time in nine years, the Pacific Life Community (PLC) met in Menlo Park, California for their annual gathering, each time concluding with a blockade of the main gate at the nearby Lockheed Martin factory in Sunnyvale that produces the intercontinental ballistic missiles for launching nuclear weapons from both U.S. and British Trident submarines. On Monday, March 18, about 50 people from the Pacific Life Community were joined outside the Lockheed Martin gate by members of Code Pink and the Musicians Action Group, a marching ensemble of percussion and horns who enlivened the crowd of activists with rollicking renditions of Down by the Riverside and other peace and labor rights songs. 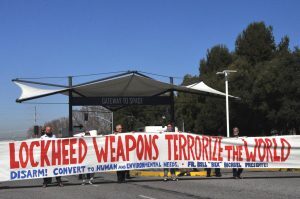 A large banner made for the last PLC blockade at Lockheed Martin – four feet tall and long enough to block four lanes of traffic – was rolled out and carried around the intersection with a bold-lettered message for the auto and rail commuters passing by: Lockheed Weapons Terrorize the World. To the rhythm of the band, most of the group followed the banner-carriers a hundred yards down the sidewalk to the main “Gateway to Space”, as an arch over the Lockheed entrance declares. Lockheed security forces pulled a low fence across the road while Sunnyvale police stopped traffic at the intersection from approaching the entrance. As the banner was carried into a blocking position from one side of the road, a line of police marched in from the other, positioning themselves between the blockaders and the gate. The protesters carried with them copies of the Treaty on the Prohibition of Nuclear Weapons to inform Lockheed workers and management that when the treaty is ratified, building nuclear weapons and their delivery systems will be in violation of international humanitarian law. After awhile, formal warnings of trespass and imminent arrest were given, along with the opportunity to leave. But none of the blockaders did. One by one, eleven people were arrested, the large banner slowly dropping to the ground as each in turn was handcuffed and taken into custody. Near the end of the banner, a sign held in front of it read “The Pacific Life Community Supports The Kings Bay Plowshares – Resist Trident!”, a reference to the April 4, 2018 nuclear disarmament action at the Kings Bay base in Georgia. That base is home to the United States’ Atlantic Ocean Trident submarine fleet, and it is where the British Trident fleet picks up Lockheed’s missiles to load with their own nuclear weapons. Arrested for trespass were Dennis Apel, Susan Crane, Clancy Dunigan, Calia Kammer, Andrew Lanier, Elizabeth Murray, Larry Purcell, Rush Rehm, George Rodkey, Charlie Smith and Sam Yergler. 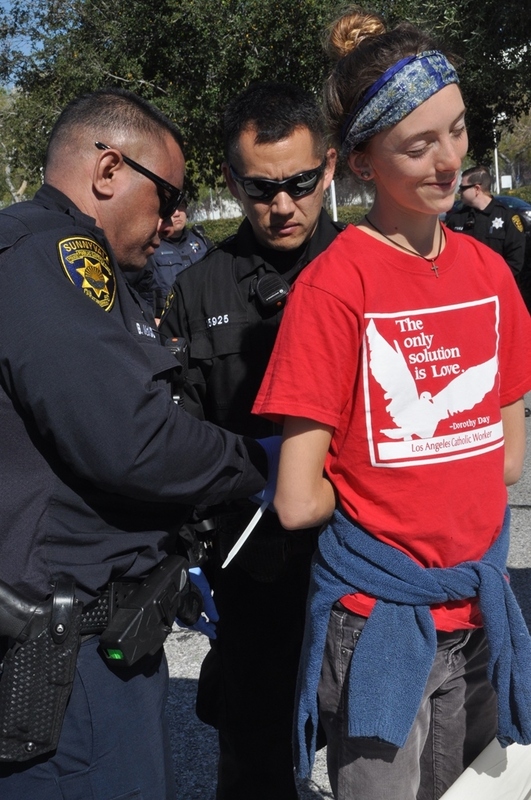 Susan Crane, a member of the Musicians Action Group, handed her saxophone to a supporter just before being arrested. They were taken to the Sunnyvale police station for processing, and all were released before noon with an initial court date in May. The Pacific Life Community is a network of spiritually motivated activists from the U.S. Pacific coast and other western states who are committed to nonviolent action for a nuclear-free future. In addition to demonstrations and blockades at Lockheed-Martin, the PLC has come together each year since 2007 for actions at the Kitsap-Bangor submarine base in Washington State, homeport of the Pacific Trident fleet; Vandenberg Air Force Base, where the Trident missile is test-launched; the Los Alamos nuclear weapons factory in New Mexico and at the Nevada nuclear weapons test site. For more information, visit the Pacific Life Community website here.